Despite sitting in my hotel room Wednesday evening and writing that Curbs' would leave the club in the summer, it still came as a shock today and as Saturday in Chicago comes to a close, I feel more and more poignant about Richard Murray's pre-match announcement. Despite Curbs' saying it was all done Friday night, this is clearly not a sudden decision by both men, manager and chairman have known for a long while that their unique relationship had come to the oft-proclaimed end of the road. But huge credit to Richard Murray for insisting on the way it would be announced to the world, truly the Charlton way, and the most agreeable to the fans. It would have been horrible to have read it in the Sunday rags. Curbs said that he "wanted to leave by the front door and not the back," and it brought a lump to my throat as Addicks rose around the ground in injury time to give the great man a standing ovation. After 15 years the fans even sung his name! He will forever be remembered at the Valley as quite rightly Jimmy Seed is. 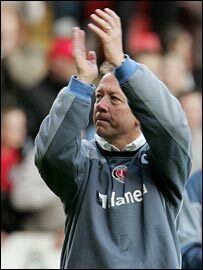 I thought about those 15 years today and I realised that Alan Curbishley has been part of my life for a very long time and half of my Charlton supporting one. Curbs has been responsible, at least partly, for some of my favourite ever days in my life. He is a legend, he has lived and breathed Charlton for every second of those 15 years and he deserves all our thanks and although it will be strange without him, change brings excitement too. I mentioned Jimmy Seed and it has been written that his departure in 1956 brought many years of despair for the club. That was down to the ownership of the club at the time, but Richard Murray and his board are not in it for the same reasons that the Gliksten's were. Murray and his fellow board members should now relish this opportunity, the time is right for change and we should put our trust in a man that other fans' would give their right arms for. As for Curbs, I think he will take some well deserved rest and do some world cup punditry, but he is after all a football man 100%, 24-7. Mrs C will I'm sure soon get fed up of him moping around at home. Whatever he does, he deserves his place in Charlton Athletic's rich history. So this is new territory for us Addicks isn't it? It's clearly imperative that the board makes its choice soon to enable the new man to build for next season. There will be many changes, and I really hope that we use players such as Darren Bent, Young, Ambrose, Thomas and Andersen as foundations and not as forms of currency. As for the new man? Well there is plenty of choice and I know who I don't want. People that have been out of the game for too long, and managers from beyond the Championship, it is a different world managing a Premiership club, therefore the new man ideally needs previous experience of doing so. My two favourites would be Chris Coleman or Paul Jewell. You have to believe that these two men would consider Charlton a step up, but of course it will always come down to money. If we are to look down a division then what about Adrian Boothroyd or Billy Davies supported by Les Reed? Ian Dowie would appeal too, despite his current appalling taste.